Director of Public Prosecutions (DPP) Kim Hollis has claimed that a woman implicated in two murders acted as a spy to ascertain the location of victims for her co-accused to shoot them dead, adding that the same gun was used in the two murders that unfolded. CCTV helped the prosecution significantly in building the case against Shakeel Ryan and Shakilla Hanley – the two charged with murder. They are accused of murdering David Springette and Shaun Richards in separate incidents this year. Both alleged murderers, along with Essadro Jefferson, are also charged with conspiracy to murder one of the victims – Springette. In one of the cases, Richards was shot outside his residence in Long Look on the evening of May 6, but he died two days later at Peebles Hospital. The prosecution told the court yesterday that CCTV footage shows that, moments before Richards was shot, the accused woman – Hanley – was driving her rented vehicle around the Long Look area where the murder victim lived. “We believe the reason for her journey was to ascertain the location of the victim…and to report [back to her co-accused, Ryan],” the DPP said. She added that, moments after the woman was seen, Richards sustained five gunshot wounds. Following the fatal shooting, the gunman was caught on CCTV running away from the crime scene and disappearing in an area of Long Look. The woman’s rented vehicle was seen leaving the same area where the gunman went, the prosecution said. DPP Hollis alleged that the gunman escaped in the woman’s vehicle. In the other case, Springette was shot dead outside the Wayside Bar in Fat Hogs Bay on the evening of June 21, after surviving two previous gun attacks. 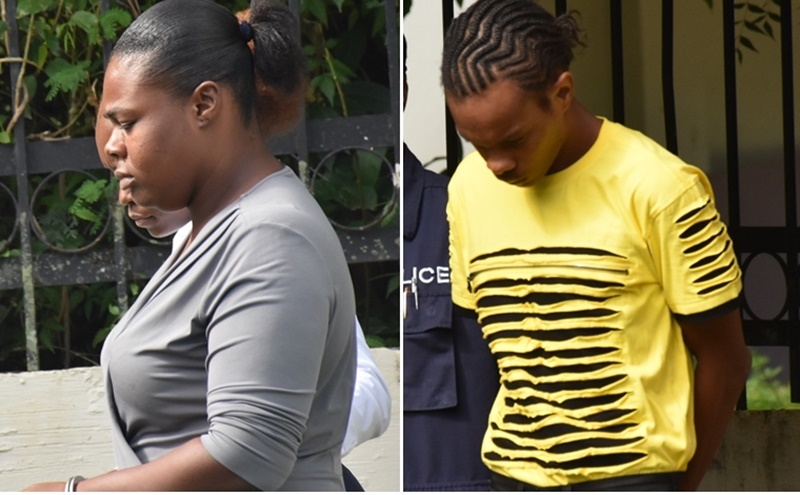 DPP Hollis told the court yesterday that all three accused – Jefferson, Hanley, and Ryan – conspired in the murder of Springette. She alleged that, after the three conspired, Jefferson made an attempt to kill Springette last year, but failed. He was eventually charged with attempted murder. Where he left off, Hanley and Ryan ‘finally succeeded’ in June this year, DPP Hollis told the court. The court was also told that, on the day Springette was murdered, Ryan and the accused woman were again captured on CCTV – this time walking in the Fat Hog’s Bay area. The prosecution alleged that the two were scooping the area to get a lock on Springette’s location. Springette was outside Wayside Bar at the time. Ryan and the accused woman met up with friends, but Ryan disappeared. Shortly after, the sounds of gunshots were heard. The court was told that exactly 38 seconds after the shooting, the accused woman left her friends and started to walk alone in the direction of Wayside Bar where Springette was murdered. The prosecution further told the court that the firearm used in the attempted murder of Springette in 2016, was the same one used in his subsequent murder. Additionally, that said murder weapon was used to kill Richards, the prosecution claims. The three accused persons are to return to court on September 6. Magistrate Vareen Vanterpool presided over the case yesterday.